Take a trip to a Mediterranean beachside cafe with this Mediterranean Quinoa Salad. 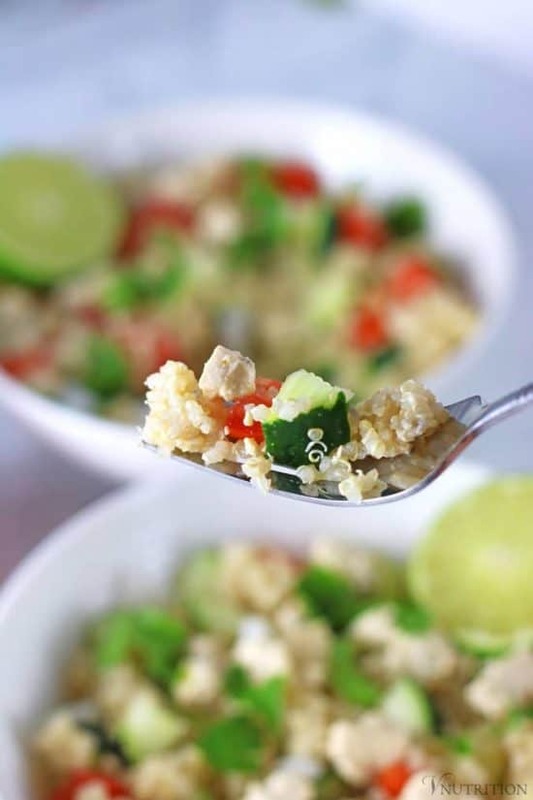 Quinoa and veggies are topped with tasty vegan feta for a bold and delicious salad. I was taking a gander at my recipe page and realized I don’t have many salads listed besides my Easy Vegan Lentil Salad with Leeks. Sure I have a number of pasta salad recipes (definitely check out my Ranch Pasta Salad that’s some good stuff) but I knew I needed a few more veggie-based salads. I think the problem is that my husband Matt is the salad maker in our house. He loves playing around with ingredients and always creates something delicious for us (he prides himself on it). This summer, however, I wanted to make something really tasty to impress him salad-wise and I think have it. 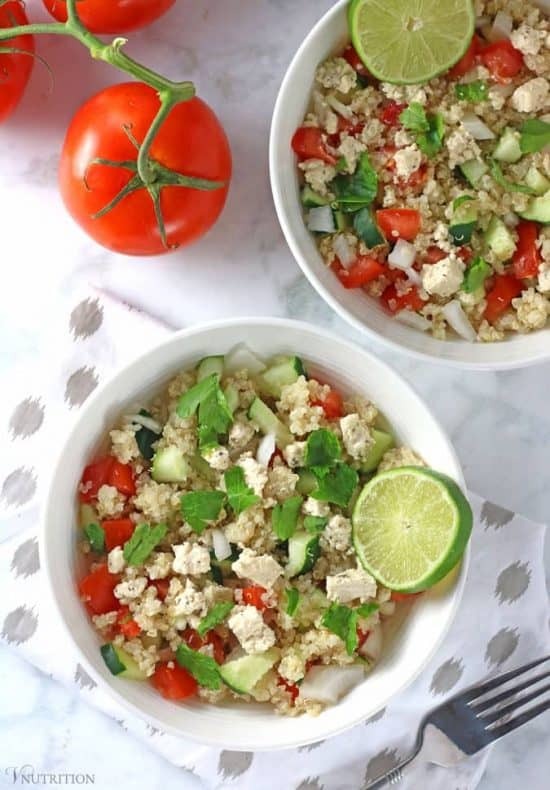 My Mediterranean Quinoa Salad is filled with veggies and topped with my Tofu Feta. I love a fresh salad in the summer. It’s such a great way to cool down when the weather heats up. Most of the summer I crave salads but don’t make them often because sometimes they feel too complicated, that’s why I let Matt do the salad making. This Mediterranean Quinoa Salad, however, is easy to make. Just chop up a few veggies, stir together the dressing, and add in pre-cooked quinoa (which you’ll have on hand if you use my Vegan Meal Prep Tips). Then top with some of my Tofu Feta. Don’t skimp on the feta, it makes the dish! Because of my love of travel, I picture myself eating this Mediterranean Quinoa Salad at a beachside cafe in Greece overlooking the blue water and beautiful white buildings. Make yourself your own bowl and take yourself to Greece too! 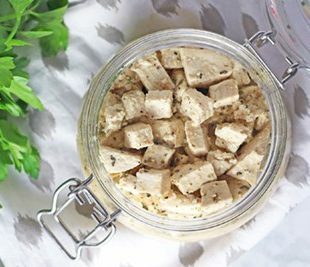 Add all ingredients for salad in a bowl (except for the tofu feta) and mix gently. Mix dressing ingredients in separate bowl and add to salad. 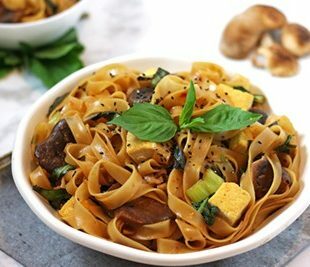 Top with tofu feta and enjoy! * Nutrition Info does not include the tofu feta. Please see that recipe for nutritional info. 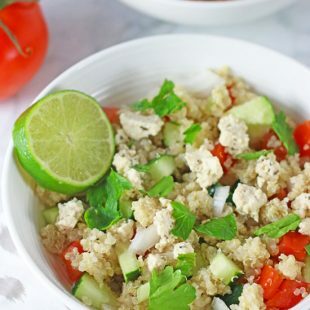 Yum, this looks simple and delicious – love the fresh flavors and anything with quinoa. Thanks! 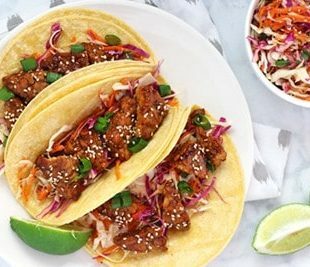 What a fantastic summer recipe. I love how fresh and vibrant it looks. Thanks so much Amy! I hope you enjoy! I rarely make salads as well! I think I got spoiled when I worked at a restaurant and having lots of pre-washed and cooked veggies. And if I am eating a salad I want a very well thought out mix of stuff. Yummy! 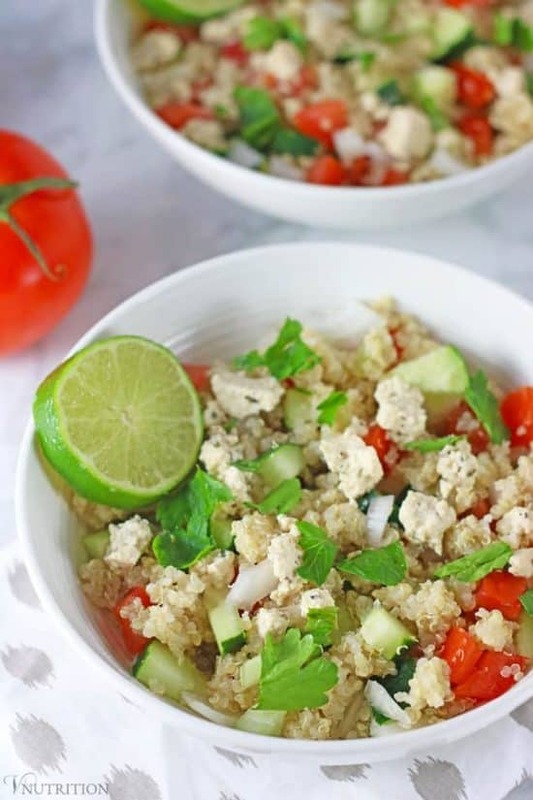 I love quinoa based salads, and how you can enjoy them hot or cold. Thanks for the recipe Mary Ellen!